Much like yesterday, my mind felt convoluted by the Guiding Thought; however, today, I was able to recognize that the Guiding Thought makes good sense: it is not convoluted, I am. It’s a good thing. My brain is scrambling to re-order itself in a new way. That’s it. I went through several minutes while listening to the Guiding Thought, wondering if I was supposed to embrace the scrambling being done, or insert my logical brain, and enlist it to focus. I chose the first and embraced the scrambling. Maybe it’s closer to say I just went with it; my brain already felt convoluted, so I allowed my mind to check out—not to become passive, but I gave it permission not to think. I gave it permission to not try to figure out how my mind and heart focus on Divine Presence, not try to understand how thinking or speaking in accordance with Divine Will releases Divine Substance, not try to figure out how Divine Substance shows up in activity and financial affairs. Yup. I let it go. I listened and colored, while giving my heart and my abstract mind permission to be. They were a little surprised. No, they were a lot surprised. In fact, they were so surprised they did not know what to do. They get so little practice at having free reign. Even when I am coloring on most days, I still keep my rational, logical brain in charge (this represents >this<, that represents >that<, etc. ), but not today. And nothing made any sense in my drawing. Even the words that came out in the drawing made no sense. (I’ve debated whether or not to share it >smh< because my rational brain has been telling me how terrible and stupid it is, but I will continue with today’s trend of keeping my mind out of it: the picture is at the very end). And, you know what? I’m going to choose to allow myself to not make sense. I am going to let my abstract mind and my heart do some figuring out for me. Because, you know why? My rational mind needs all the help it can get. It apparently doesn’t know it, but it does. Up ‘til now, my rational mind has been all shoulders-back, chest puffed up, walking around like it’s the boss, and it really needs to just be put in its place, and allow the mind and heart to do what they do best, give the rational mind some help, and work on scrambling and re-ordering. I hope, soon, I will be able to elaborate on “just be put in its place, and allow the mind and heart to do what they do best”… What is the rational mind’s place? 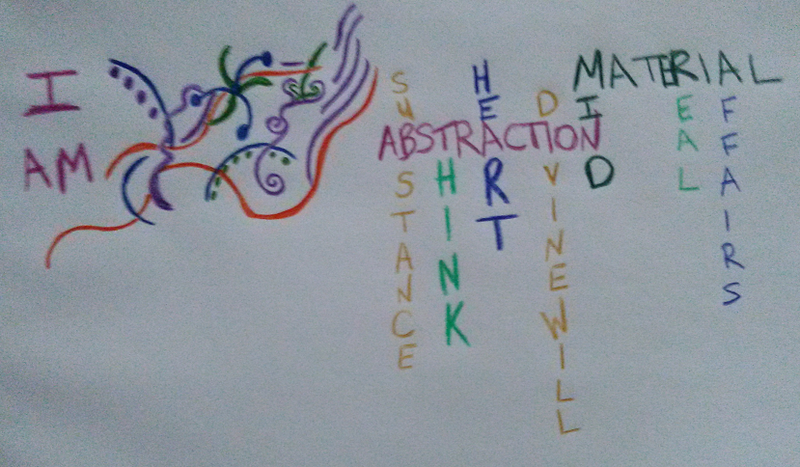 What do the heart and the abstract mind do best? Even with the rational mind on the bench, it wants the answers to these questions. It wants to know what it does best (you see, even with it on the sidelines, the rational mind made the connection that if there’s something that the heart and abstract mind do best, then there is something the rational mind does best, what is it??? ); I can sense it wants to help, there’s an excitement in it about that, about doing what it does best.